LIVING HISTORY OF ILLINOIS AND CHICAGO® COMMUNITY. This group hosts junior and senior High School history and social studies classes with their educators for research and preparation of the Chicago Metro History Fair, the Illinois regional Fairs, and the state final on Illinois History Day, held in Springfield, Illinois. The group is moderated and censored for the sake of our student body (13 years old+) with a stringent set of published posting and commenting policies to keep the group focused about Illinois history. We are over 46,000 members strong and growing. The Digital Research Library of Illinois History® is sanctioned by and linked from the official Chicago Metro History Fair website, the Illinois History Day website and the Illinois Historic Preservation Agency (IHPA) website as a resource for students, educators and the general public. Special collections include defunct amusement parks of Illinois, lost towns of Illinois, Chicago's forgotten neighborhoods, and other surprises. Because of Facebook’s restrictions on each groups number of posted images stored (approx. 5000 per group) the oldest ones are deleted when new posts are made, I found it necessary to create a way of ‘Saving Illinois History, One Story at a Time,’ so on November 6, 2016, I started the Digital Research Library of Illinois History Journal™. The Journal presents Illinois history in a friendlier format than Facebook allows and has more functionality, such as a search function that works properly, intermingled images and text, and videos that are embedded and play on the page, just to name a few. Being membership free, anybody online can add their comments to the postings in the Journal. 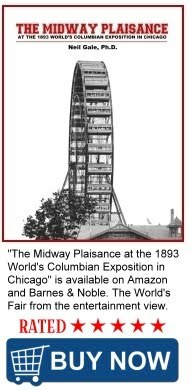 The largest collection of 1893 World's Columbian Exposition antique searchable PDF books, documents and research papers online. Included are special attractions, special days at the Fair, and unbelievable 3D rendered movie tours of the Fair. The FREE daily statewide newspaper. I've personally created unique designs and recreated vintage logo'd products, including over 100 styles of shirts and dozens of colors, mugs, home accessories and more. 100% of all sales support the projects listed here for the costs of Internet hosting, URL fees, and other associated fees. THE ILLINOIS HISTORY STORE IS NOT-FOR-PROFIT. The Chicago Postcard Museum is a privately endowed, independent organization devoted to collecting and presenting Chicago history through postcard imagery and their correspondence. The Museum displays a portion of my personal collection of rare, antique, vintage and contemporary Chicago postcards.